theoretical principles of TESOL in the areas of speaking and listening, in preparation for a new English competency examination implemented for Chinese middle-school aged students in 2016. Description of program: During 2015 American Language Academy (ALA) was invited to provide intensive teacher training to Chinese teachers of English in the northeastern city of Shenyang. The Chinese government planned to add an additional competency examination to their education system, in which middle-school students must demonstrate minimum proficiency levels in the areas of listening and speaking in order to progress to the most desirable high schools. 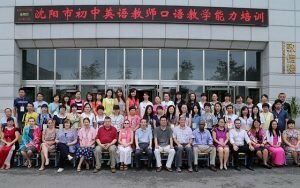 The ALA teacher training team was invited by the Shenyang International Exchange for Cultural Education (SIECE) to provide specialized, more effective teaching strategies and activities focusing on speaking and listening to the teachers, while also sharing essential theoretical principles endorsed by TESOL International. The instructional model utilized in Shenyang mirrored that which is used in all ALA branches. Classes centered around instruction which integrated the four major language skills: reading, writing, listening and speaking. Also, the Shenyang classes were built around constructivist learning theory, with regular implementation of the Communicative Language Teaching approach and the Task-Based Teaching approach. Learner-centered instruction rather than a teacher-centered approach was demonstrated, which promoted more active engagement in the learning process on the students’ part. Participating in this style of teaching was a new and challenging experience for the teachers, who nevertheless took away from the program an enhanced sense of self-confidence and self-esteem, in terms of their personal speaking and listening skills. Each program was divided into three (3) consecutive ten-day (10) sessions, with the teachers receiving six (6) hours’ daily training and practice in the theoretical background and implementation of the activities. At the conclusion of each training session, groups of teachers presented lesson plans they had designed based on the ALA Way of instruction to their fellow teachers. They also presented a prepared oral presentation based on their own original writing. In the winter 2015 training program, the ALA team consisted of three trainers who successfully worked with approximately 180 Chinese teachers. The second program, in the summer of 2015, expanded to nine trainers and 600 local teachers participated. In the winter 2016 training program, the ALA team consisted of nine trainers who successfully worked with approximately 225 Chinese teachers. Considering that each Chinese teacher works with around 100 students per day, the ALA training team has potentially touched the lives and learning experiences of over 100,000 middle schoolers in Shenyang, China. SIECE, the Liaoning Province school district, and the ALA training team all considered the training itself to be very successful. Additionally, the ALA trainers shared marvelous intercultural experiences with Chinese culture and the residents of the city of Shenyang. The trainers have wonderful memories of this once in a lifetime experience to cherish from now on. ALA is eager to further enrich our Chinese connections and will welcome such opportunities in the future. Dates(s) of program: January-February and July-August, 2015. January-February, 2016. January 2015 program: Program director: Rogers Walker, with trainers Pat Talbert and Mercer Bufter. July 2015 program: Program director: Pat Talbert, with trainers Adam Freeman, Alton Rose, Mai Moua, Sarah Adams, Alaina Webb, Pat Talbert, Elaine Maggard, Nashma Carrera, Charlie Wilson, and Warren Morrison. January 2016 program: Program director: Pat Talbert, with trainers Charlie Wilson, Alton Rose, Stacy Bogart, Robert Sudy, Briana Rogers, Chris Harper, Andrea Price, Mark Dodge, and Warren Morrison.